I noted in a previous blog post that my husband Paul and I are live-in caretakers at the William Clapp House in Dorchester, Massachusetts. This house was built in 1806 and serves as the headquarters of the Dorchester Historical Society. Paul and I assist the Society with special events, and we give tours of the house and grounds. The Clap name can be found in Dorchester records dating back to the 1630s – the surname is often spelled with one “p” for earlier generations of this family. Occasionally descendants of some of the early Clap families visit the house for a tour. They typically ask about William’s family line in order to determine how they are related to him. I enjoy these inquiries because it provides me with an opportunity to learn more about the different branches of this family. Recently I took a closer look at the ancestry of another distant relative of William Clapp: my husband. Roger Clap was born in Devonshire, England in 1609. He left England in 1630 as part of the Great Migration to New England, settling in Dorchester. He encouraged several of his siblings, as well as his cousins Thomas and Nicholas Clap, to leave England and join him. Roger played an active role in the community, serving on a number committees such as the Committee on Highways, and was admitted to the Ancient and Honorable Artillery Company in 1646. Late in life Roger wrote his memoirs for his family, which were first published several decades after his death. William Clapp was born in Dorchester 3 March 1779. He was a descendant of both Roger Clap and his cousin Nicholas Clap through the 17 March 1704 marriage of Roger’s granddaughter Hannah Clap and Nicholas’s grandson Ebenezer Clap. 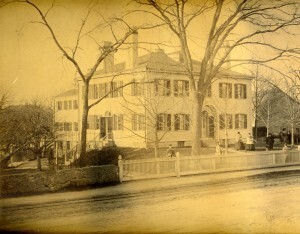 William Clapp built his home in Dorchester in 1806, and in December of that year he and Elizabeth Humphreys were married in the formal parlor of the house. They had nine children, but sadly five of them died young, including three children from typhoid fever within four days of each other. Four generations of William’s family resided in this house over the span of about 150 years, the last being Frank L. Clapp, William and Elizabeth (Humphreys) Clapp’s great-grandson. Frank was married for many years, but never had any children. He sold the house to the Dorchester Historical Society in the mid-1940s, but he continued to live at the house and work as the property’s caretaker until his death in 1953. My husband Paul is descended from Thomas Clap, the brother of Nicholas Clap and cousin of Roger Clap. Thomas emigrated from England in 1633 and lived in Dorchester for a brief time before removing to Scituate in the late 1630s. This line of Paul’s family continued to reside in the Hingham/Scituate area for nine generations. Looking at my husband’s Clapp family line and comparing it to William Clapp’s ancestry, I put together a small chart for Paul to illustrate the relationship between the two families. 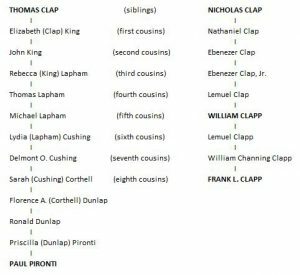 Paul and William Clapp are fifth cousins seven times removed by way of Thomas and Nicholas Clap (and sixth cousins seven times removed through the relationship between Thomas Clap and Roger Clap). 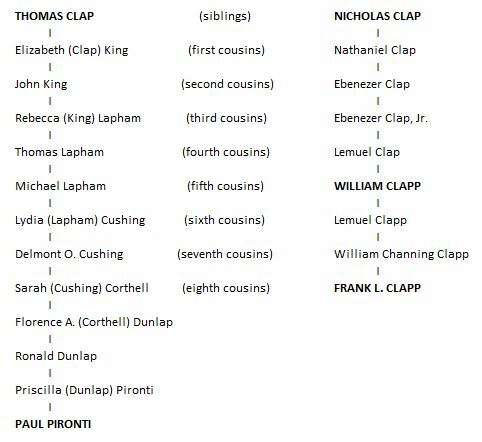 As noted on the chart, Frank L. Clapp and Paul are eighth cousins four times removed. Knowing Paul’s connection to this family, it’s interesting to think how Frank Clapp worked as a caretaker at this house, and now sixty-three years later, his cousin Paul has taken on the same role. The Great Migration Begins: Immigrants to New England 1620-1633, Volumes I-III, online database at AmericanAncestors.org. (Originally published as: Robert Charles Anderson, The Great Migration Begins: Immigrants to New England 1620-1633, 3 vols., Boston: New England Historic Genealogical Society, 1995). Massachusetts Vital Records to 1850, online database at AmericanAncestors.org. It is so wonderful to hear the history of a home that has remained close to its original family. I grew up an Air Force brat always moving to new places, daughter of a Sheldon, who also has ancestors from Scituate area back to 1600’s. My roots had to be movable but genealogy has allowed me to reconnect with those deep family roots that connect me emotionally,if not geographically. Thanks Wendy, I’m glad you enjoyed the post. I enjoyed reading your article on the CLAPP family. Like your husband, I am also a descendant of Thomas CLAPP; he was my 9x great grandfather. Here is my CLAPP line: Mary (4), Joseph (3), Samuel (2), and Thomas (1). Mary CLAPP (4) married William HODGES 1719/20 at Scituate, MA. I would like to visit the William CLAPP House one day. I’ll have to visit you sometime. I’m a Clap or Clapp descendant too. Roger Clapp, if it’s the one there’s a statue of in Watertown Square. Descending through my mother’s Washburn ancestors who hailed from Washburn, Maine and before Massachusetts. Especially interested in Corthell family — I descend from Kinsman Corthell, Per “Early Pleasant River Families’, by Leonard F. Tibbetts and Darryl B. Lamson. The line would be (l) Levi b 1 Oct 1790, bapt at ScituateL , (2) Kinsman b 1773 Passamaquoddy, bapt at Hanover, MA, m Lucy Hall; (3) Love Moore Corthell b Columbia, ME 8 Feb 1802, m Leonard Worcester b 28 Feb 1798 Columbia, ME; (4) Alfred Small Worcester and so on. Would be very interested in any info on the early Corthell family –origins, etc. Many thanks for the information posted — it opens more doors for me! Interesting to learn about the Wm Clapp house and the family history. Roger Clap, 1609-1691, was married to my 9th great grand aunt Joan Ford. Her sister Abigail, wife of Elder John Strong, was my 9th great grandmother. Thanks Marilyn! I’ve enjoyed researching this family and hearing from people with various ties to the family. Jennifer, I hope you have a chance to stop by for a tour. It will also give us an opportunity to talk about our connection to the Miethe family (we have corresponded via email in the past). My great-great grandmother was Josephine (Miethe) Grueter. So Eileen, we’re cousins by marriage! I’m descended from Thomas two ways, through his daughter Elizabeth who married Deacon Thomas King Jr and through Samuel who married Hannah Gill. I commented earlier (Roger Clapp descendant) above. I would love to tour the house & am in Brighton on the western edge of the city. Are there set dates or how would I arrange it please? Thank you Sarah. Hi Sarah, tours are free and take place the third Sunday of every month from 11:00 – 4:00 (with the exception of this month, we will not be giving tours this Sunday). The Lemuel Clap House, which belonged to William’s father, is located next door and is also open for tours on the same schedule as the William Clapp House. I hope you can stop by for a tour! Roger Clapp was my Grandfather nine generations back,, If I ever get to Boston I would love to stop in and chat with you. Thank you for this interesting blog.